Last month, my husband had to work in Boston for several weeks. It seemed like a good opportunity to take the younger Chase children sight-seeing, so I drove fourteen hours north and we spent Dad's last week there with him. Okay, maybe an older Chase mama wanted to see a few sights too. One attraction I got to cross off my bucket list was Plimoth Plantation, a recreation of the Pilgrims' initial settlement in the New World. I worried the kids would find it too similar to Jamestown Settlement (in Virginia) or Roanoke Island Festival Park (in North Carolina) -- both places Mom has taken them. However, my husband reminded me it was my vacation too, and I'm glad he did. Since we are probably one of the few families to have visited all three sites within the same year, I decided it might make for an interesting blog post. During the sixteenth and seventeenth centuries, the English attempted to establish a beachhead in North America to counter the mighty Spanish empire. These three settlements are their most famous. You've probably read about all of them in history books. In 1587, John White left more than 100 English settlers (including his daughter and newborn granddaughter Virginia Dare) on Roanoke Island (in present-day North Carolina) while he returned to England for supplies. Unfortunately, the Spanish Armada prevented his return for three years. When he finally got back, he found the fort abandoned with no trace of the settlers. The fate of the "Lost Colony" is one of America's great mysteries. Fort Raleigh National Historic Site is operated by the National Park Service and marks the location of the settlement. The visitor center tells the story of the local tribes and English colonists. It's free to the public and park rangers offer regular talks, but as the settlement itself has been lost to time, there isn't much to see other than Civil War-era earthenworks. 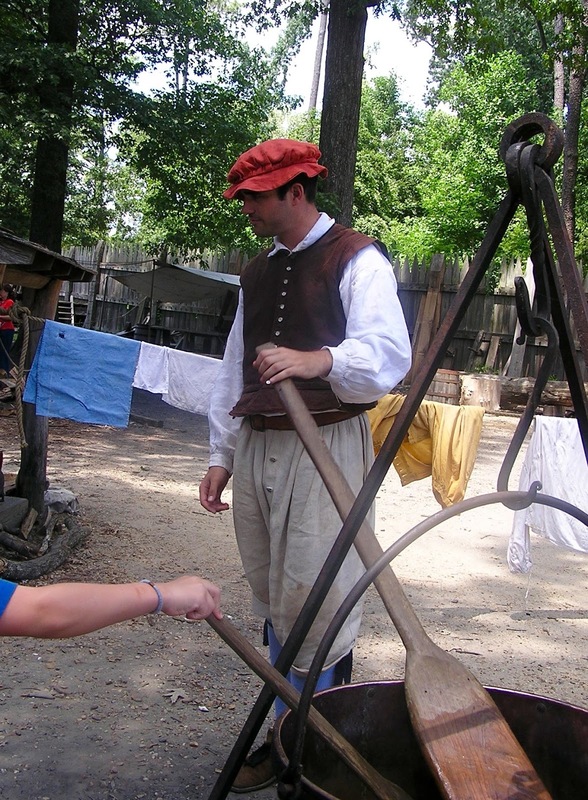 Nearby Roanoke Island Festival Park is a recreation of life in sixteenth century America. 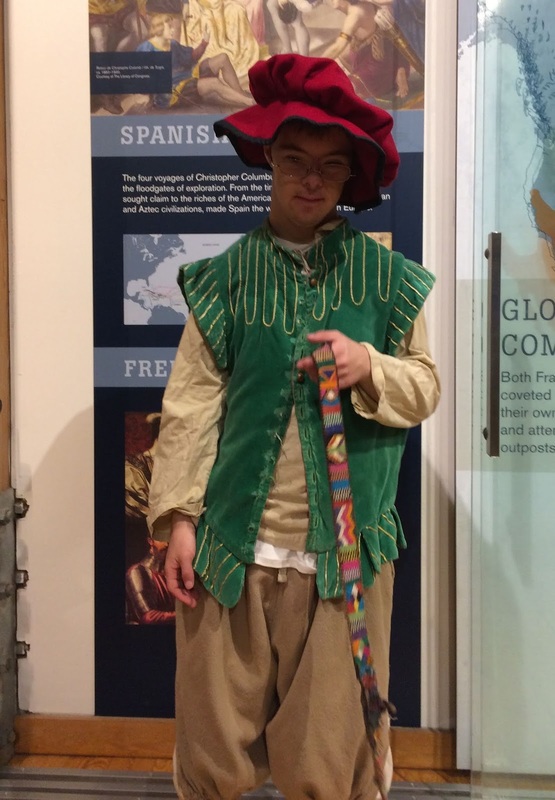 It has an Adventure Museum with hands-on activities for children (and their parents), a model Algonquian village and English fort, and a replica of a sixteenth century ship. Costumed interpreters interact with visitors at each of the attractions. Festival Park is the cheapest of the three re-enactment sites, and the ticket is good for two consecutive days. I took our youngest two there in fall, and they had so much fun we went back the next day with the rest of the family. Because it was the off season, there were few tourists, and the re-enactors spent a lot of time answering my youngest son's many questions. My family's favorites: museum and blacksmith shop. We came home with several nails and an 'S' hook. Twenty years after Roanoke disappeared into history, the English again endeavored to start a colony in the Americas. They tried a new site about 100 miles north of Fort Raleigh, just up the James River from the Chesapeake Bay. Mismanagement, hostile relations with their native neighbors, and natural disasters nearly sank the venture, but the timely marriage of Pocohantas and John Rolfe brought a period of peace that allowed the colony to flourish and become the first permanent English settlement in North America. men can do laundry. Who knew? Historic Jamestowne (part of Colonial National Historic Park) is a cooperative effort between the Association for the Preservation of Virginia Antiquities and the National Park Service to preserve the site of the original Jamestowne fort. (Founded in 1889, APVA bought part of the island for preservation before the creation of the National Park Service.) What makes the park special is the working archeological dig (Jamestown Rediscovery) that unearthed the location of the 1607 fort a couple decades ago. The Archaearium houses over 4,000 artifacts recovered by the excavations. Park rangers offer talks and guided hikes. The ticket for adults 16 and over is $14 and is good for seven days at both Historic Jamestown and nearby Yorktown Battlefield (site of the Revolutionary War's last battle). Mom loves the Archaearium -- yes, even the old bones of long-dead colonists. She's strange that way. Jamestown Settlement was created in 1957 by the Commonwealth of Virginia to commemorate the 350th anniversary of Jamestown's founding. 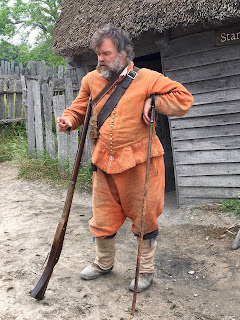 Like Roanoke Island Festival Park, it has a museum, a recreated Powhatan village and English fort, a glasshouse, and replicas of the three ships that brought the settlers to Virginia in 1607, with costumed re-enactors to demonstrate seventeenth century life. 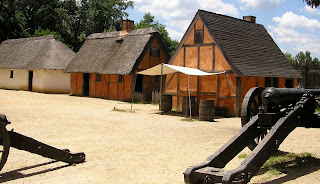 Because we live nearby, we have visited Jamestown Settlement numerous times. My youngest son's favorite place is the Powhatan village. Mom never misses a musket demonstration. While Jamestown is more expensive than Roanoke Island, you can get a combination pass that will also let you visit the Yorktown Victory Center. Thirteen years (and several failed ventures) after Jamestown, a group of religious separatists decided to found a settlement in America where they could worship according to their beliefs. Bad weather pushed their ship further north than they had intended, so they settled in Massachusetts, just south of present-day Boston. Plague (from interactions with Europeans) had wiped out many of the native peoples in the area, so the Pilgrims founded their settlement on an abandoned clearing. Like those early colonists at Jamestown, their mortality rate was high, but a year after their arrival, they celebrated their survival with a thanksgiving feast. Pricilla Alden, but he wouldn't bite. On the surface, Plimoth Plantation is a lot like Roanoke Island and Jamestown Settlement. It has a craft center, a recreated Wompanoag homesite and Pilgrim village, a grist mill, and a replica of the Mayflower (the ship that brought them to America). What makes Plimoth special is the calibre of their re-enactors. Each one plays the role of one of the original settlers (complete with an Elizabethan accent), and they do not break character. 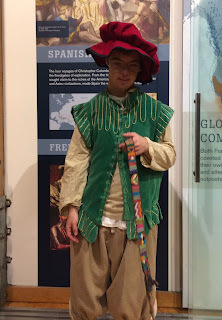 We "met" William Bradford, Miles Standish, and Stephen Hopkins among others the day we were there. The Wampanoag re-enactors are real Native Americans, although they seemed to hail from tribes other than Wampanoag. Plimoth is the priciest of the three. You can get tickets to just one of the three attractions or a combination good for the village, the grist mill, and waterfront exhibit. My husband asked if there was a special needs discount for middle son, and quite frankly, the amount they took off shocked us (in a pleasant sort of way, you understand). The Mayflower replica is being repaired for the quadricentennial of the Pilgrims crossing in 2020, so the waterfront exhibit was rather lacking. However, I loved the Pilgrim village, and the working, seventeenth century grist mill far exceeded our expectations. If you get a chance, you should visit any of these. If you're really lucky, you should see all three. Very informative post, CJ. When you said that Plymouth Rock looks like a rock...well, you know me and rocks...so I googled it and saw the portico-like structure that surrounds it. However, I didn't get a feel for the size until I saw the pic of two men working on sealing the crack. It's still not as big as I imagined it would be, but without the men to show scale, it did look like any other little rock in my collection. As a matter if interest, in 1639, my husband's 8th great-grandfather, Abraham Cruttenden, was one of the first settlers of Guildford, New Haven, CT. He was also one of the 25 signers of the Plantation Covenant in 1639. Very informative post! Hubby and I visited Jamestown in 1970. It a was very small endeavor at that point. I remember the glassblowing and you had to walk quite a way to the other exhibits. He was stationed in Portsmouth for a few months. We also went to Williamsburg. It was a lovely, warm fall day.